Executing any of the above efforts requires answering: Who, What, Why, When, Where, How, How Much? Analytics can be a project, product, program or portfolio depending on the scope and level of ambition. Every company needs a multi-year execution playbook that describes how to mobilize people, processes, platforms and technology to deliver analytics initiatives (at different levels… project, department, LoB, cross-enterprise) that support the business. As you can see from above, leading and executing Analytics is not trival. Especially in a world where only 20-30% of software projects meet expectations. Analytics Projects: What do firms want to achieve? Need a visual drag-and-drop approach that allows analysts to work with large data sets, develop and refine models, dashboards and collaborate at scale without having to code. Data-driven insight is more elusive than ever for today’s business users. Companies are using outdated, on-premise analytics software that requires an army of experts who must build data warehouses, create schemas and overcome other time consuming technical hurdles just to access data and then securely deliver insights to business users. When business users do get reports, they are not only out-of-date, but are delivered in the form of static presentations and spreadsheets that are difficult to explore, slice and dice. In addition, these reports are challenging to access—let alone drill into—from a mobile device, making them practically worthless when and where they are needed most. To make matters worse, unstructured data from connected products, customer-facing apps and social networks is completely disconnected from the business because legacy analytics platforms are unable to process it. What apps and infrastructure (Hadoop, NoSQL, visualization toolset etc.) do you put in place to fix current limitations? How do you leverage the Cloud – real-time, multi-tenant architecture – as part of an analytics strategy? What data science tools and techniques will you leverage, build and deploy? Do you execute projects with in-house talent or outsourcing partners? 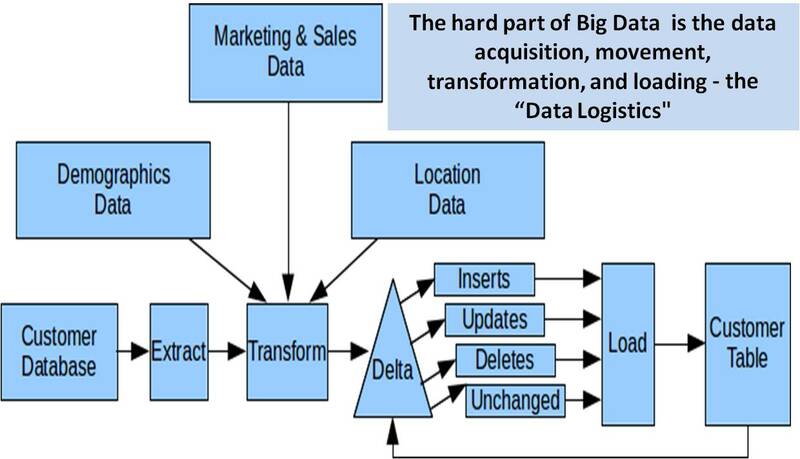 Figure below illustrates the growing complexity in enterprise analytics today. As every business process becomes data-driven the execution scale and scope is evolving daily. Data technologies are evolving rapidly and coming into the enterprise mainstream. In other words, moving from a “nice-to-have” to a “must-have”. Multi-year IT projects are dead. Innovation is occurring at such a rapid pace that employees and business units are no longer content to wait weeks or months for an idea to come to fruition. Businesses want fast cycle… agile capability delivery that they can leverage ASAP. Rapid prototyping is the mantra. Business users are sick of sitting around and waiting for IT to deliver. They are bypassing IT and bringing new tools to get the job done. This is one reason we are seeing Tableau Software, Qlikview, Spotfire and others make in-roads into the divisional and departmental ranks. Encourage fast experimentation with data – quick prototyping. Speed – the system needs to provide feedback to the user in seconds and milliseconds. Visual – no templates, dialog boxes, wizards that constrain our thoughts. Instead provide a canvas for discovery. Self service — Giving people control so they can do it. I am a firm believer that have a good data strategy is only 10%. Rapid Execution is 90%. 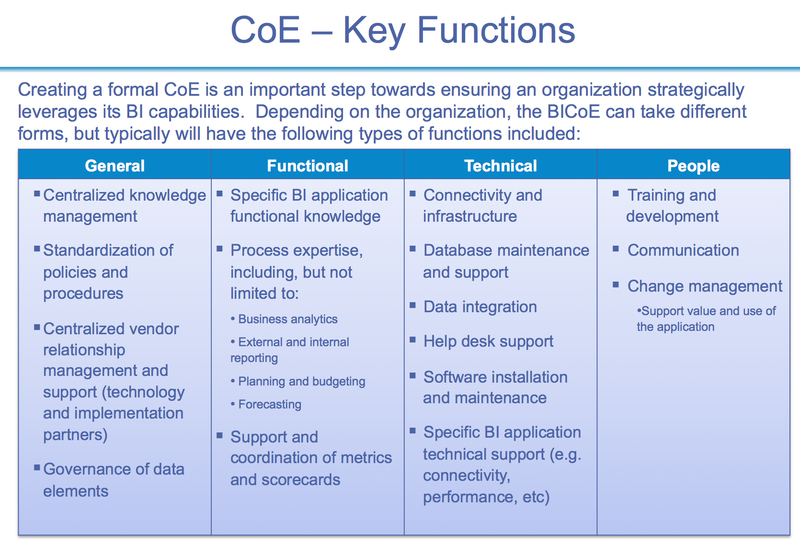 So it should come as no surprise that most firms tend to struggle with BI, analytics and reporting project execution. The rest of this blog post explores reference architectures, design patterns, best practices and real-world examples for building and sustaining the next-generation analytics architecture. Business Problem: Which Vendors do you Partner with? JUMBLE OF POINT SOLUTIONS is the norm in most large corporations… Disparate vendors, disparate capabilities, different interfaces, all acquired over a long period of time. Given the solution complexity it’s highly unlikely that one vendor can meet all the needs of an enterprise. So every firm will end up with quite a few vendors who all may have overlapping solution sets. Tech budgets are fragmented…. Rationalizing the vendor landscape and creating a consistent business analytics architecture is a big managerial challenge by itself. The challenge facing managers is how to implement business analytics strategy and objectives using a variety of vendors. How to cut through all the hype, noise and clutter in the marketplace to execute a custom data (analytics, BI) strategy that delivers value. Business Problem: What is your Analytics, BI and Reporting Architecture? SILOS STILL PREDOMINATE.. Coherent cross-channel digital experiences? Shared customer data and unified processes in support of the customer? Not really happening yet. When it comes to executing your strategy, your enterprise architecture for Business Analytics may matter far more than your strategy itself. There are a lot of capabilities that need to come together or evolve together as part of the Business Analytics Enterprise Architecture (EA). A EA landscape figure that I found useful is from Forrester Research. This illustrates the complexity IT executives have to wade thru in a large enterprise. Figures like this are academic and directionally useful to facilitate thinking. Trying to implement every layer or develop all this at once would be a kiss of death. In reality you need to test, develop, bubble up small proof of concepts. Also every vendor platform you procure adds competing and conflicting functionality at each layer. Most people assume that buying a vendor platform say MicroStrategy would address all these capability needs. Yes and no. A MicroStrategy platform might serve a specific project needs well but making it an enterprise platform (multiple use cases, multiple divisions, multiple countries) and getting rid of everything (sunseting) else is a challenging problem. I have wrestled with this issue with a CIO recently. Business was sold on MicroStrategy for everything. CIO was huffing and puffing trying to understand the implications on his current application landscape, what to eliminate/replace and how this new platform fits into his legacy landscape. Every company has unique and valuable data. But how much is it worth, and how do you monetize that data into ROI? Monetizing Analytics and Data is a #1 priority in most firms. Making sense of their growing quantities of data is part of this effort. However, implementation is the biggest roadblock for institutionalizing analytics and generating actionable insights. Planning and architecting data-driven, real-time decision-support is a growing strategic imperative. Laying the analytics groundwork is a key managerial challenge…What vendors do you invest in? Build vs. Buy vs. Cloud Lease … What platforms and infrastructure do you implement for discovering, analyzing, reporting, visualizing, and exploring? The information demands of the business have always outpaced the ability of the technology and the IT teams to keep up. Recent research indicates that many CEOs lack clarity about the CDO (chief data/analytics officer) role and what it takes to execute enterprise level analytics projects. The result: false starts, failed initiatives and ceding valuable time to competitors who already have a better understanding. The complexity of apps and infrastructure around Analytics Projects is mind-boggling… hence the challenge in translating grand visions to execution. Neural networks uncover the hidden, nonlinear relationships between inputs and outcomes, for example, between people’s characteristics and their behavior. Neural networks are particularly effective in finding hidden structures within massive amounts of data, and dealing with nonlinearities, diverse data, and interrelated variables. SVD is a latent factor linear model that can, with high accuracy, predict preferences for large numbers of customers and items including who will buy what, or who will be motivated by a specific offer. It creates “behavioral DNA”—a map of each individual that can be used to describe, group, and ultimately predict his or her actions. This approach helps categorize individual customers by characteristics and behavior across large number of categories, for example: purchases, payments, rewards, or delinquency, providing an enhanced ability to predict behavior, develop robust segments, and know customers. SVD has particular strength in dealing with missing data and developing predictive segmentations for offer types, suggesting it may be powerful in enhancing segmentation. RBM is a computational method that is used to find correlations and predicting outcomes from incomplete data. It trains attention on massive amounts of information to uncover hidden structures and correlations, similar to neural networks. Then, it compares new information to the patterns and correlations it has already identified. RBM is a natural framework for incorporating massive amounts of unstructured data. It is fully extensible and flexible; easily incorporating new data as it is generated. RBM has particular strength in dealing with nonlinear interactions and missing data and in producing probabilistic output, suggesting it may be powerful in areas such as fraud, default prediction, and profitability modeling. KNN works on the theory of “birds of a feather flock together.” It finds important and predictive similarities that improve the ability to create segments that will act alike, and to assign new people or products to segments. KNN models learn from recent events and adapt accordingly, making them highly powerful and dramatically improving business results. KNN is used to modify the credit risk assessment of a customer based on the recently observed behavior of his or her peers. For example, a sudden increase in delinquencies for mortgage loans originated by brokers in New York will increase the risk for a member of that group, even if the individual has few other risk factors. In the Netflix example, using a neighborhood model, where a customer is compared to his peer group, in combination with a global model creates a far superior predictive solution. Ensemble is an approach that knits together the results from different methodologies, typically resulting in a better performing overall model. Each model usually predicts more accurately in some customer-item pairs and worse in other pairs. The ensemble approach can blend their unique strengths together and yield a final prediction that is more accurate than any single predictor. Ensemble provides better solutions by combining several models, each of which contains a unique contribution to the solution. It enables integration of long- and short-term effects and provides a measure of prediction confidence. In the Netflix competition, Ensemble performed significantly better than any single algorithm; doubling the effectiveness. How to future-proof Business Analytics investment decisions? What are the tools for helping people see and understand their data? What are the tools that turn data into multi-dimensional intelligence? Right tools for descriptive, prescriptive, predictive analytics, exploratory vs. confirmatory analysis? What about the data quality? Between 70% and 80% of the time spent on an enterprise analytics project is consumed by preparing the data. Most people try to short-cut this. Sadly…it’s “Garbage in, Garbage out” if data quality checks are not robust. Be sure to carefully QA data feeds, sources to ensure its integrity. What is the right platform? 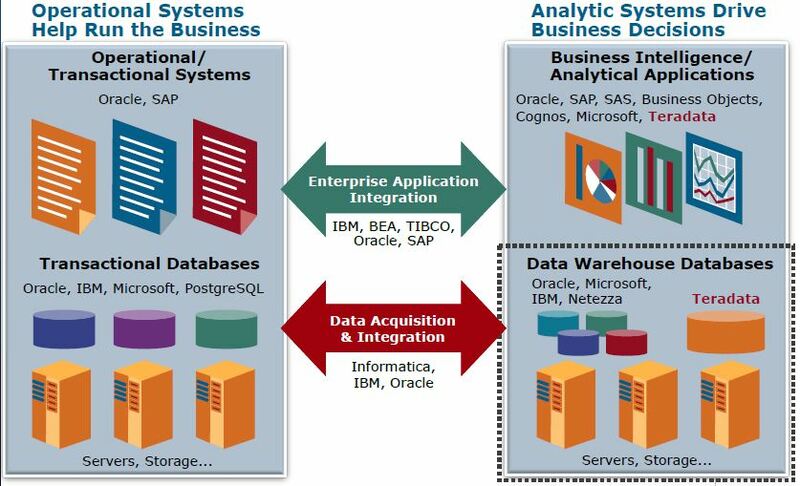 The enterprise analytics market is in the middle of an accelerated transformation from traditional BI systems (focus on measurement & reporting) to those that also support analysis, prediction, forecasting, simulation and optimization. As multi-channel and omni-channel interactions mushroom (shown below) new sub-categories are constantly emerging such as social media analytics – Analytics that listen, measure and analyze social media performance to grow the business, enhance reputation, improve customer experience. Social media analytics is a hot category as net promoter/influencer driven word-of-mouth and peer-to-peer interaction is considered more powerful than traditional advertising. Where to Start: Business Need or IT Foundation? I think a clear use case driven driven analytics project is the only way to go. Otherwise there is a lot of “spray-and-pray” investment in the platform & infrastructure with the hope that users will come. One area which is clearly driving enterprise analytics demand is Data driven Marketing. A huge demand driver is marketing analytics to address critical business needs like identifying root causes of client attrition & developing retention strategy. Marketing analytics covers a gamut of customer behavior: response, churn, product up-sell and cross-sell, best marketing creative, days to next purchase, days to next visit, next best offer etc. Marketing Analytics typically includes (1) Marketing Operations for efficient marketing resource management; (2) Campaign Management for planning and performance analysis across multiple marketing channels; and (3) Digital Messaging for executing relevant, personalized communications and delivering a consistent customer experience. Turn customer-related data from inside and outside your organization — real-time, batch, structured, and unstructured — into powerful, individuated marketing programs and actions. Engage in 1:1 conversations with individual customers, across any channel. Driving customer loyalty through improving recommendations. Engagement Analytics and Personalization: Delivering targeted content based on user behaviors and preferences. Display relevant content in the right context to achieve desired results. And the reason organizations are increasingly turning to it is that it improves responses, boosts conversions, and delivers a superior customer experience. Relevant technologies – segmentation management, ad serving, mobile content targeting, email campaign management. A/B and multivariate tests: A/B testing is a way to test design changes and determine which ones produce positive results. A/B testing allows you to show visitors two versions of the same page and let them determine the winner. It is a method to validate that any new design or change to an element on the webpage is improving your conversion rate before you make that change to your site code. A/B Testing takes the guesswork out of website optimization and enables quantitative data-backed decisions that shift business conversations from “we think” to “we know.” By measuring the impact that changes have on metrics such as sign-ups, downloads, purchases, you can ensure that every change produces positive results. Customer Profiling: Advances in analytic approaches enable us to uncover for the first time a 360 degree view of a “Customer Profile.” Customer Profile is a way of interpreting each customer’s psychology, relationship drivers, and behavior, based on his or her relationship and interactions with all touchpoints of an organization, and it brings to light the hidden reasons behind each customer’s purchase and relationship patterns. Customer Profile is revealed by analyzing, among other things, relationship length and individual customers’ purchase behavior in all its dimensions: quantity, amount, where, what, how recent, how frequent, and how sensitive to different types of offers. Customer Profile captures the full extent of a customer’s relationship with a company in a single, predictive package that organizations can use to ensure that they are maximizing the value of each relationship and each interaction. And because it allows companies to deeply understand what their customers want, need, and respond to, it enables firms to communicate with them through their preferred channels and frequency, as well as to target and price offers to them for the products and services they value most. The key purpose of a customer profile is to create consistent experiences – messaging, tone of voice, etc. across channels. For companies, this customer expectation means all channels must connect to a single customer warehouse – physical or virtual. A customer’s profile should exist once, information can be captured on how that customer has engaged across the organisation – across campaigns, products, support, etc. That single profile must be accessible to all customer-facing roles in the organisation, be they in Marketing, Customer Services, Technical Support, the Social team – any and all employees that are expected to interact with customers in a manner that’s of value to the customer and to the company. The one customer profile warehouse will be a single source of customer truth for the organisation. Today’s explosion of digital information requires firms to analyze new information faster and make timely and well founded decisions. Information management addresses that need not only the right policies, skills and processes but also a solid foundation in technology. It is a holistic approach to managing, improving and leveraging information to increase an organization’s confidence in decisions made–within big data and analytics, and within operational business processes. Big data analytics describe analytic platform environments with significant data volume, variety, velocity and complexity. Companies are just beginning to deal with emerging big data that typically has unknown relationships where fast analytic iteration is required to unlock new insights. Visual Analytics: Before Visual Analytics, employees relied on data analysts to build reports. The goal is to eliminate this extra step by presenting information graphically. Typically based on in-memory processing technology, Visual Analytics can also take on big data. 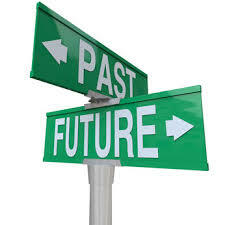 In-memory innovation requires no data movement or user programming for its fast analytical processing. Staff analyze data on their own to build accurate reports for management, saving significant time and money. 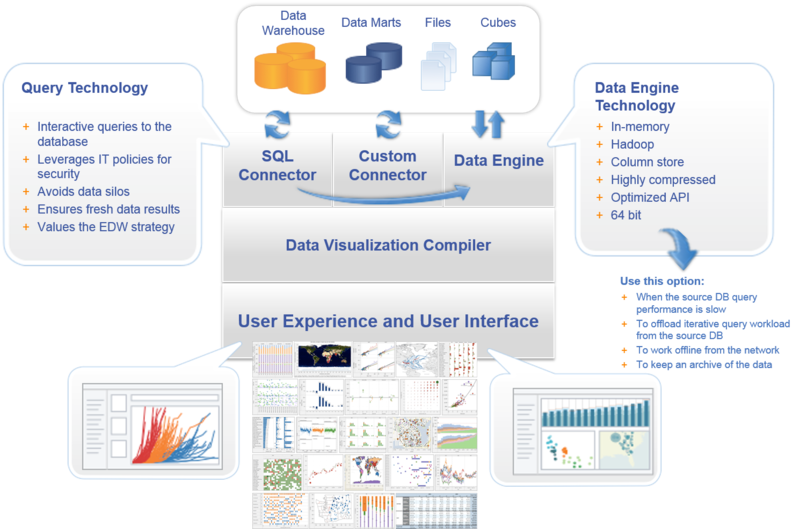 Typical visual analytics platforms include SAS, Tableau Software, Qlikview and Tibco Spotfire. Reporting: Provides the ability to create highly formatted, print-ready and interactive reports, with or without parameters. Dashboards: A style of reporting that graphically depicts performances measures. Includes the ability to publish multi-object, linked reports and parameters with intuitive and interactive displays; dashboards often employ visualization components such as gauges, sliders, checkboxes and maps, and are often used to show the actual value of the measure compared to a goal or target value. Dashboards can represent operational or strategic information. Excel integration: Often Excel acts as the reporting or analytics tool. Various BI tools provide integration with Microsoft Excel, including support for native document and presentation formats, formulas, charts, data “refreshes” and pivot tables. Advanced integration includes cell locking and write-back. Making databases and spreadsheets understandable to ordinary people. Interactive visualization: Enables the exploration of data via the manipulation of chart images, with the color, brightness, size, shape and motion of visual objects representing aspects of the dataset being analyzed. This includes an array of visualization options that go beyond those of pie, bar and line charts, including heat and tree maps, geographic maps, scatter plots and other special-purpose visuals. 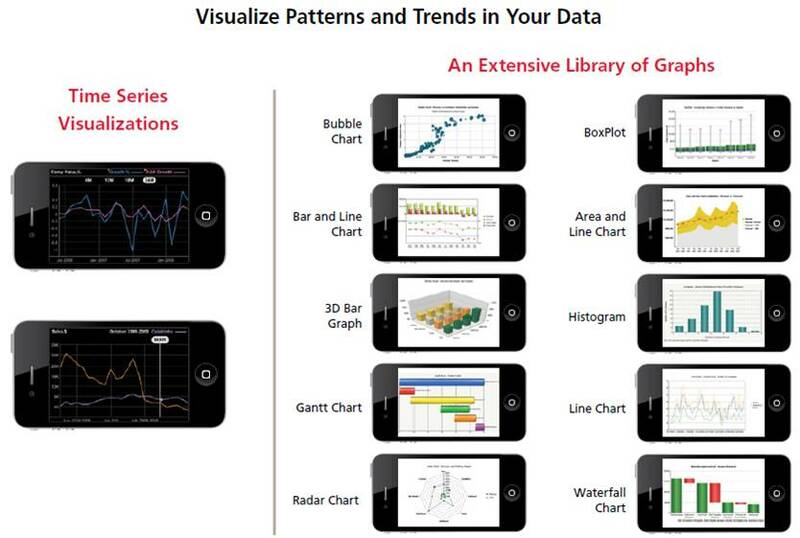 These tools enable users to analyze the data by interacting directly with a visual representation of it. Search-based data discovery: Applies a search index to structured and unstructured data sources and maps them into a classification structure of dimensions and measures that users can easily navigate and explore using a search interface. This is not the ability to search for reports and metadata objects. This would be a basic feature of a BI platform. Embedded advanced analytics: Enables users to leverage a statistical functions library embedded in a BI server. Included are the abilities to consume common analytics methods such as Predictive Model Markup Language (PMML) and R-based models in the metadata layer and/or in a report object or analysis to create advanced analytic visualizations (of correlations or clusters in a dataset, for example). Also included are forecasting algorithms and the ability to conduct “what if?” analysis. 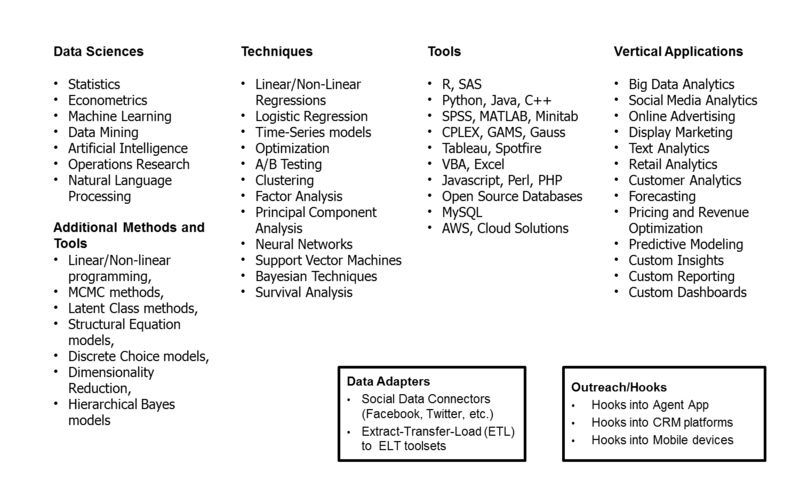 Online analytical processing (OLAP): Enables users to analyze data with fast query and calculation performance, enabling a style of analysis known as “slicing and dicing.” Users are able to navigate multidimensional drill paths. They also have the ability to write-back values to a database for planning and “what if?” modeling. This capability could span a variety of data architectures (such as relational, multidimensional or hybrid) and storage architectures (such as disk-based or in-memory). BI infrastructure and administration: Enables all tools in the platform to use the same security, metadata, administration, object model and query engine, and scheduling and distribution engine. All tools should share the same look and feel. The platform should support multi-tenancy. Metadata management: Tools for enabling users to leverage the same systems-of-record semantic model and metadata. They should provide a robust and centralized way for administrators to search, capture, store, reuse and publish metadata objects, such as dimensions, hierarchies, measures, performance metrics/key performance indicators (KPIs), and report layout objects, parameters and so on. Administrators should have the ability to promote a business-user-defined data mashup and metadata to the systems-of-record metadata. Business user data mashup and modeling: Code-free, “drag and drop,” user-driven data combination of different sources and the creation of analytic models, such as user-defined measures, sets, groups and hierarchies. Advanced capabilities include semantic autodiscovery, intelligent joins, intelligent profiling, hierarchy generation, data lineage and data blending on varied data sources, including multistructured data. Development tools: The platform should provide a set of programmatic and visual tools and a development workbench for building reports, dashboards, queries and analysis. It should enable scalable and personalized distribution, scheduling and alerts of BI and analytics content via email, to a portal and to mobile devices. Embeddable analytics: Tools including a software developer’s kit with APIs for creating and modifying analytic content, visualizations and applications, embedding them into a business process, and/or an application or portal. These capabilities can reside outside the application, reusing the analytic infrastructure, but must be easily and seamlessly accessible from inside the application, without forcing users to switch between systems. 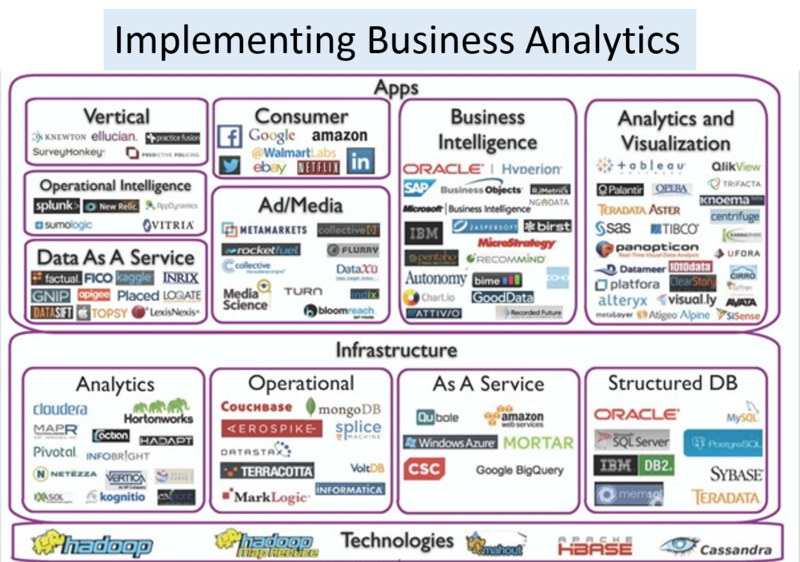 The capabilities for integrating BI and analytics with the application architecture will enable users to choose where in the business process the analytics should be embedded. Data quality… Garbage in, garbage out. Be sure to carefully QA data feeds, sources to ensure its integrity. Structured and unstructured data from any and all data sources—including databases, XML feeds, CSV output, EBCDIC, social media and more. 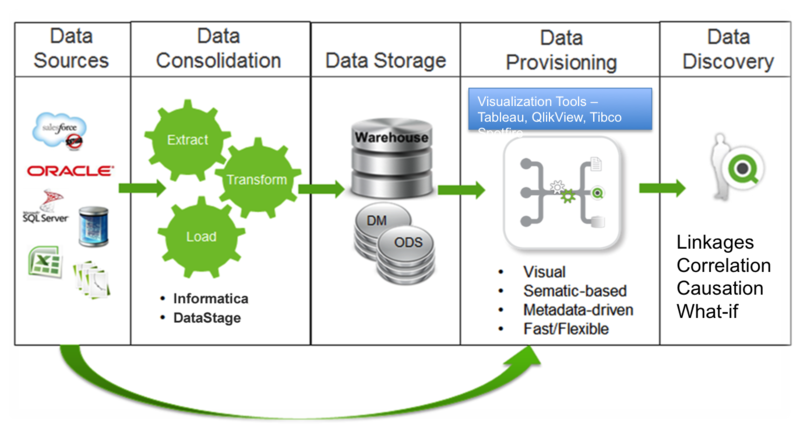 Datawarehousing: Load once, use many times…enable cross functional analysis. 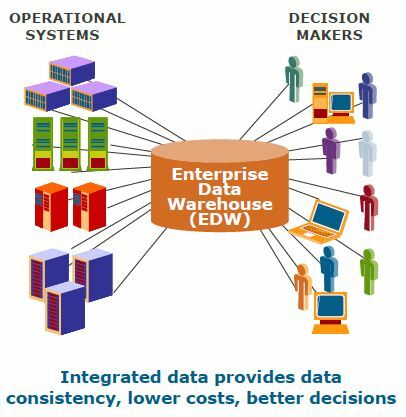 Integrated data provides data consistency, lower costs and better decisions…only if implemented well. Many datawarehouses projects tend to become white elephants and endup delivering only a fraction of the approved business case. Cloud Integration. For cloud analytics to be a real option for a complete BI solution you need 4 things: (i) to be able to connect to cloud data sources, (ii) to connect to business applications in the cloud such as Salesforce, (iii) to connect to on-premises data sources such as Excel spreadsheets and SQL Server, and (iv) to get the analytics where you do your work. This means new “web data connector,” that will enable apps like Tableau to connect to web services through REST APIs, JSON data, etc. Data Virtualization: Virtual datamarts and Virtual data stores are increasingly common consolidation style architecture implementation today. The target goal is lower cost of execution ($/query, $ / user), and agility by leveraging SOA principles such as abstraction, shared semantic models and data standards. A hacker compromises a credit card account and manages to make a few purchase, plenty of damage has already been done, even if that account is cut off within minutes. What analytics apps and infrastructure do you put in place to prevent this? Choosing the right platform, toolset is a decision that impacts success. There are many considerations for analytics tool and platform selection. Data types, business requirements, total cost of ownership, lock-in, as-is and to-be processes etc. Also there are wide range of costs to consider. License fees are just one piece of the puzzle. Bottomline… How can you most efficiently solve the business problem today? Don’t get into endless religious debates about vendors, tool capability and future gaps. A good team can deliver the target solution with almost any vendor product. Gartner for their Magic Quadrant vendor analysis came up with a way to score vendors based on 17 categories of core feature/functionality. This MQ analysis I think is extremely useful to any IT executive as they try to cut thru the vendor clutter and noise. 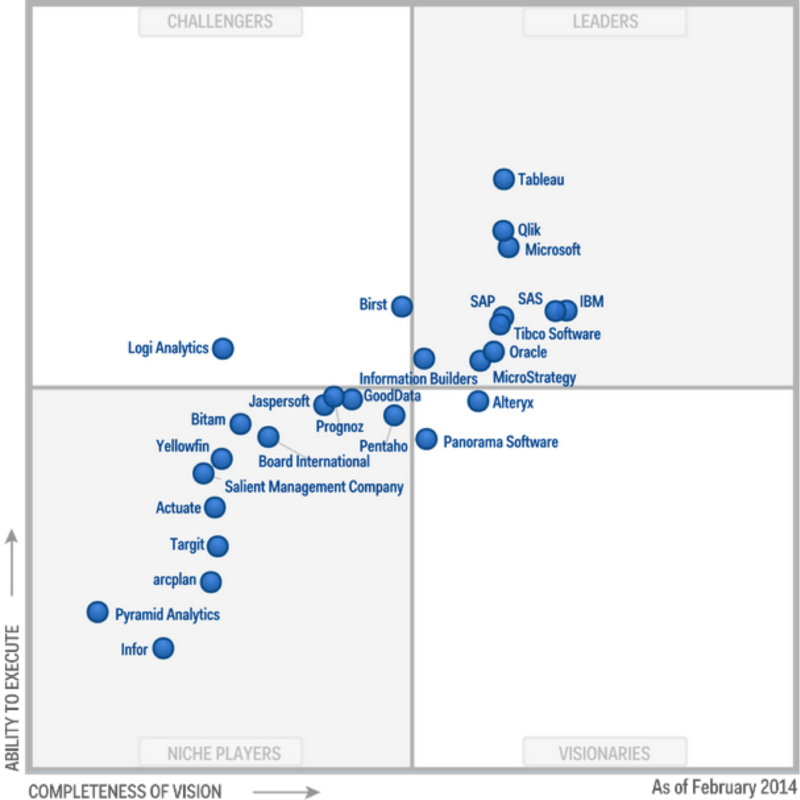 Gartner’s 2014 Magic Quadrant as a Reference for Vendor Landscape analysis. Executives frustrated with their data gathering and distribution systems. Making analytics operational and implementing analytics driven decisions is a challenge for most firms. A CoE could be the blueprint for creating business value. How do we get there in phases? How do we navigate the evolving Big Data Landscape and make the right choices? Organizations need to use the right people, tools and techniques to manage the data ecosystem. These tools need to be supported by new approaches and governance processes to achieve true value from the data. Analytics apps are increasingly the foundation of an organization’s fabric providing critical information to various departments. As the number of departmental applications, powered by different technologies, in an organization grow, the IT departments face a challenge to manage and maintain them. Ultimately, an organization will advance from having isolated applications towards platform standardization. Many companies deploy Analytics (and BI) applications as departmental solutions, and in the process, have accumulated a large collection of disparate BI technologies as a result. Each distinct technology supported a specific user population and database, within a well-defined “island of analytics.” At first, these dept islands satisfied the initial needs of the business, but early success in departmental deployment sowed the seeds for new problems as the applications grew. Successful applications always expand. The second phase of Analytics (and BI) is hallmarked by BI applications that have expanded to the point where they are no longer isolated islands. Instead, they overlap in user populations, data access, and analytic coverage. As a result, organizations are now faced with an untenable situation. The enterprise is getting conflicting versions of the truth through the multiple disparate BI systems, and there is no way to harmonize them without an extraordinary ongoing manual effort of synchronization. 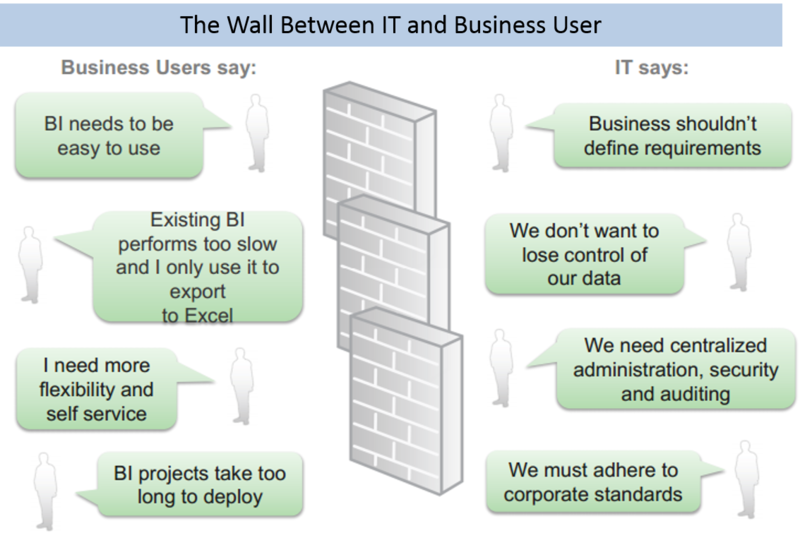 Equally problematic is the fact that business users are forced to use many different BI tools depending on what data they want. The third phase of Analytics (and BI) is one where a single platform delivers one version of the truth (golden source of data) to all people across the enterprise. It can access all of the data, administer all of the people, eliminate repetitive data access, reduce the administrative effort, and reduce the time to deploy new BI applications. The fourth phase tends to be Analytics Outsourcing and CoE. As the platform becomes standardized and there is continually less evolution to greater functionality, greater scalability, with seamless integration, and ever greater economies of scale. Cost pressures and slowing of innovation will cause management to look for external vendors to run the platform cheaper. 1. Source: Gartner 2012 Worldwide Survey of More Than 2,300 CIOs Survey Shows CIOs are Using Technology to “Amplify” Enterprise. 2. To compete on analytics, companies need to make analytics a central part of their day-to-day execution, part of their DNA. Why Do BI and Analytics Projects Fail? Why Big Data Isn’t Enough: Tomorrow’s Technology Will Be Built Around Workflows — The healthcare industry’s extensive efforts to collect and store patients’ records have yet to yield significant improvements in care, argues Acupera’s CTO Imran Qureshi in Wired. Qureshi uses this as a case illustrating the limitations of data warehousing without yielding actionable insight from these records, explaining how integrating data analysis workflows into patient care could improve the entire cycle of treatment, integrating medical records, sensor data, and social and behavioral assessments to better inform health care practitioners’ care.